Ilya Vorobyov’s new-look SKA roared into life at the start of the KHL season to throw down a marker to the rest. A convincing victory over Gagarin Cup winner Ak Bars ensured that the regular season champion lifted the Opening Cup against Zinetula Bilyaletdinov’s men. High profile new signing Nail Yakupov opened his account with SKA’s sixth goal, while Pavel Datsyuk had two assists and Nikita Gusev, Viktor Tikhonov, Ilya Kablukov and Patrik Hersley each picked up a couple of points. That’s two years in a row that the curtain-raiser has seen SKA take the first trophy of the campaign, following last season’s 4-2 victory over CSKA. This time SKA also matched the biggest victory in the showcase game, a 6-1 scoreline that matched the beating Metallurg handed Dynamo Moscow back in 2014. The scoreboard also reflected the Petersburg team’s first Gagarin Cup triumph, sealed with a 6-1 victory in this arena at the end of that season. Much of the pre-game talk centered on how SKA would adapt to life after Oleg Znarok. The inspirational head coach’s departure was followed by something of an exodus: Ilya Kovalchuk, Vadim Shipachyov, Sergei Kalinin, Mikko Koskinen, Slava Voynov and Yegor Yakovlev all moved on, representing the departure of a huge chunk of talent and experience. But the opening goal came off a play that might have graced the previous campaign. Nikita Gusev sent Datsyuk into the zone, and the Magic Man conjured up another assist, feeding Patrik Hersley for a one-timer that left Emil Garipov with no chance. 1-0 SKA inside four minutes. After that fast start, the game maintained a high tempo. Clear-cut chances, however, were thin on the ground. 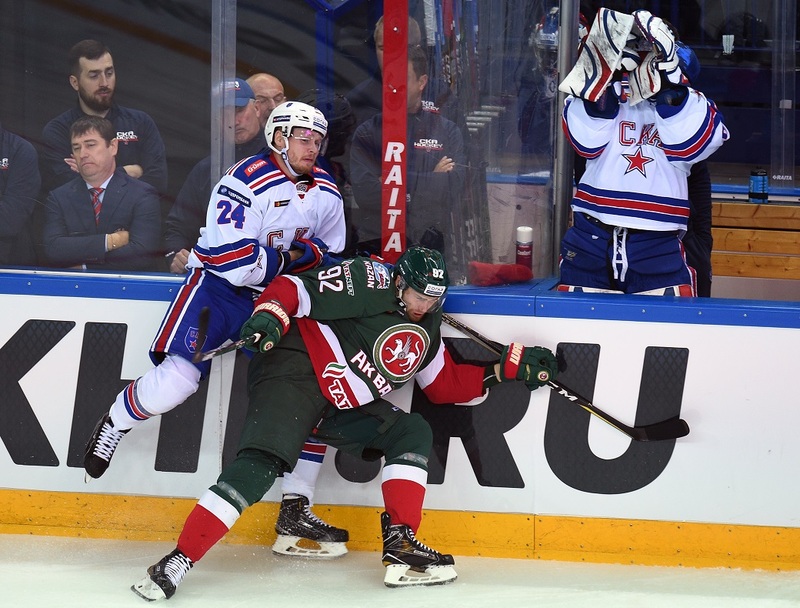 The teams traded just nine shots on goal in the opening period, with Ak Bars failing to generate much danger on the only power play of the first frame. In the middle stanza, Ak Bars found an equalizer. Rob Klinkhammer fired the puck into the slot, where Vladislav Kara hit the post from close range. The rebound dropped kindly for D-man Albert Yarullin, and he beat Magnus Hellberg to make it 1-1. But that was soon followed by SKA’s first power play of the season … and a second goal for the visitor. Once again, Datsyuk was involved, picking out Gusev with a pass from behind the net. Gusev picked the moment and fired through the five-hole. Now SKA was ready to turn the screws. Viktor Tikhonov added a third, unleashing his wrist shot off a feed from Ilya Kablukov, and the Army Men were starting to dominate the shot count as well as the scoring. The second intermission offered little respite for Ak Bars, and Kablukov added a fourth early in the final frame. Nikolai Prokhorkin made it 5-1 and, with the game out of reach, it was time for Yakupov to do his thing. The high-profile summer signing lined up with Datsyuk and Gusev, and in the 58th minute he got his name on the scoresheet with his fourth shot of the day. It was a glimpse of the class this forward can bring to any offense; a surge down the right, Roman Abrosimov left chasing shadows, and an emphatic finish past Garipov. It might only be game one of a long season, but SKA’s start was undeniably impressive. The early standard has been set.